Believe me, we have now been living for over ten years in Panama and we still have not managed to grow a papaya tree, so we are experts in this matter. The most important rule for not growing a papaya is to buy saplings in a nursery and then transplant them. Your nursery –owner will tell you that nothing is easier than growing papayas, and they are wrong. Transplanting invariably kills the papaya plant. Dying may take anything from two days to almost half a year, but die they will. The good thing is that you have spent money and put in an effort and still are empty-handed, papaya-wise. But the owner of your local nursery will love you and encourage you to try again. The nursery-owner will give you some fool-proof tips to keep your papaya trees alive, knowing that they will die anyway. But a little later, so you will probably be back for more. In our opinion, nurseries that sell papaya saplings are not much above your local drugs pusher. Another good rule to be successful at not growing papaya is to not take care of them. Lots of people will tell you that papaya trees are naturally resistant against just about anything. This is a lie. Rest assured that just about every caterpillar, aphid and grasshopper plus a couple of fungi with unpronounceable names that live in your garden, will love to dine (and lunch and breakfast) on your papaya tree. In the unlikely event that your papaya tree develops more than two leaves, the caterpillars will eat them. 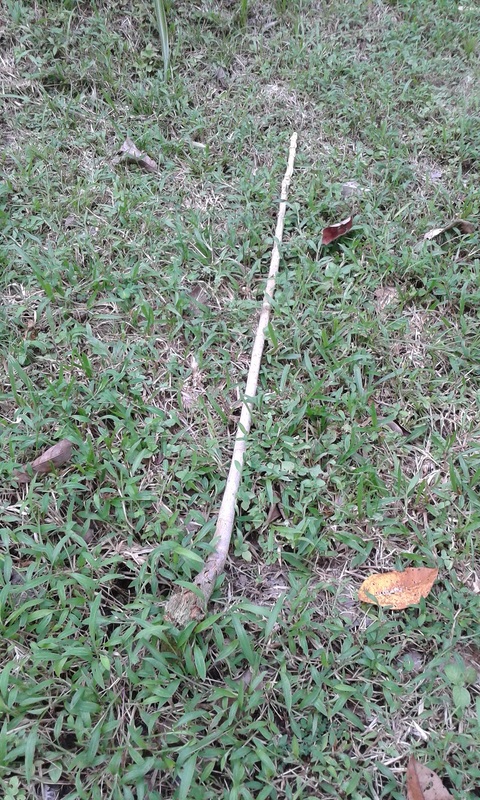 Should the stem of your papaya tree reach 5 cm diameter, stem-borers (a special group of caterpillars that lives in the stems of plants and trees such as maize (corn) and papaya) will hollow it out and your tree will die. People will tell you that papayas prefer good soils and lots of water, but will basically grow anywhere. This is not true. Papayas will grow anywhere you do not want them to grow. And never where you plant them. 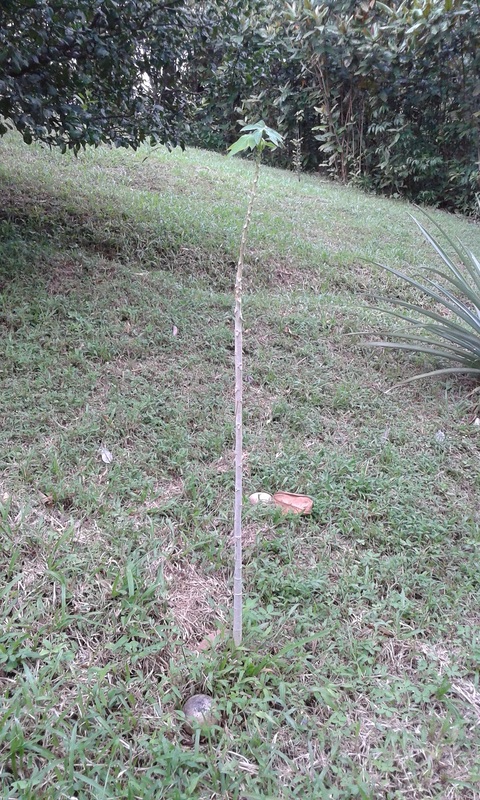 Planting the tree just about anywhere and then trying to save it by fertilizing is a good way to let your papaya tree die. And this method also has the added advantage that you spend money on fertilizer and effort on working the fertilizer into the soil without getting an actual live papaya tree. In the unlikely event that some of your trees survive, do not worry too much. You will most probably find out that all the survivors are male, which means that you will get no papayas whatsoever. Believe us, the best way to get a papaya is to buy it from your neighbour or in a supermarket. The marine habitats in our area range from shallow murky water in the Gulf of Montijo, via shallow, warm and clear coastal waters around Coiba and Cebaco to very deep waters just south of Cerro Hoya. This variety of habitats is inhabited by a great variety of marine mammals. 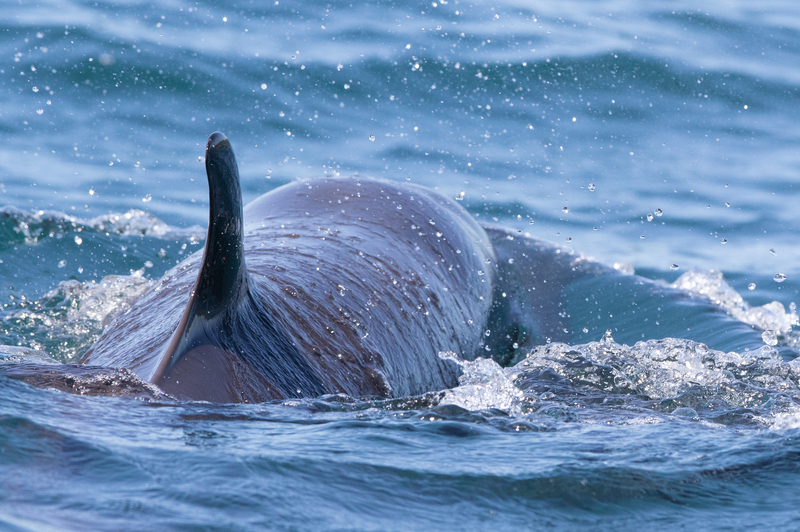 One of the rarer species that occurs in our area is the false killer whale (Pseudorca crassidens). They usually stay in deep waters. We sometimes see them at the eastern side of Coiba, in fairly deep water. Seeing false killer whales is exiting. They are large (up to 6 m), very active and usually curious. When false killer whales note the presence of a boat, they often come to investigate. Meaning you have half a dozen or more false killer whales swimming along with the boat. They like to ride the bow wave or the wake of the boat. At some stage one of the whales that swam along th e boat looked straight at me. False killer whales are quite large but slender, almost like an outsized dolphin. The adults grow 4 to 6 m long and weigh 1100 to 2200 kg. And they are fast! 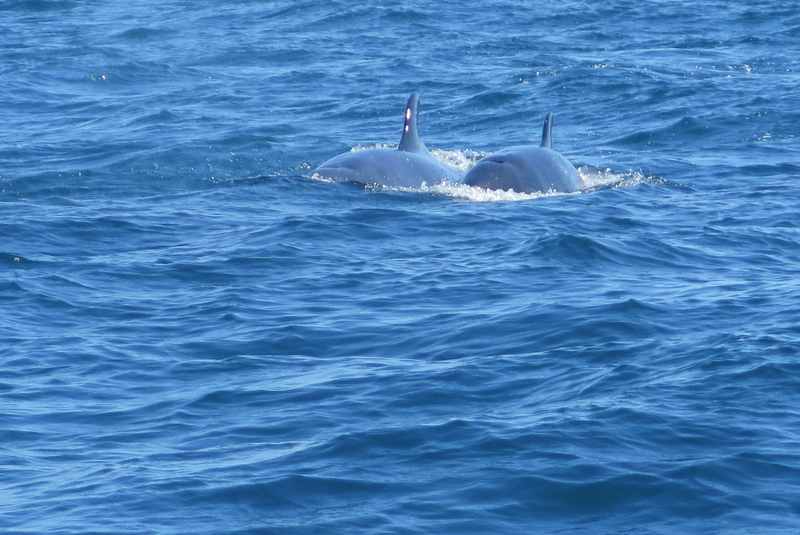 The false killer whales we saw kept up with the boat without any effort and we travelled at about 20 km/h. When they surface, usually the whole head is lifted out of the water and they often have their mouth open, showing a set of impressive teeth. False killer whales are supposed to be friendly and there are reports of false killer whales offering fish they caught to boats or divers. So far we have not been able to get into the water with them, but maybe one day that will happen. During the last 10 years or so, there were not many rules or regulations in tourism here in Panama. The ones that do exist mostly date back to 1976, appear to be somewhat haphazard and implementation can be lackadaisical. Being a tourism guide is one of those. Officially, you ought to do an exam to become a registered guide and officially, tour operators should only use registered guides. In practice, almost no one pays attention to this rule. Partly because it is not easy to do the exam. Until recently you could only take the exam once a year and you almost had to harass the Authority to find out when and where. But things are changing. The word is that in the near future the government will be stricter. But therefore, they are also promoting the examinations. 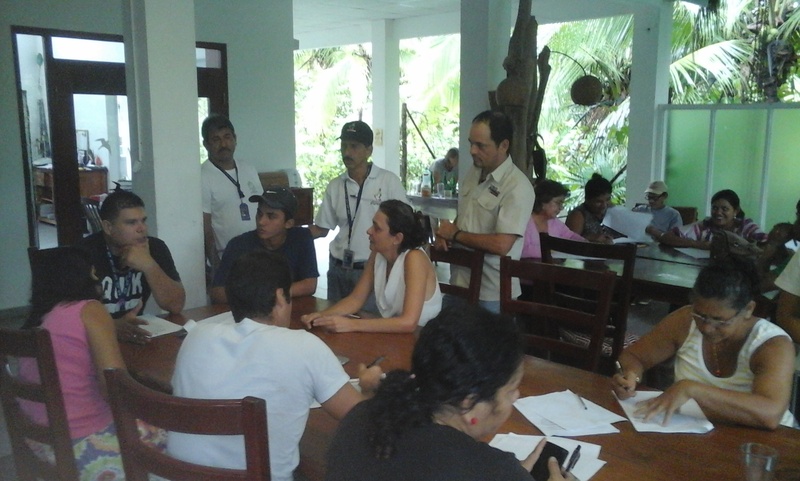 When we heard that there would be examinations in Santiago, we managed to get enough people in our area interested for the exams to be held in Mariato too, so that people could take the exam here. Loes also searched the internet for the topics of the examination, another thing that the Tourism Authority has kept carefully hidden. But with a bit of research and the help of someone who passed the exam a few years ago, we more or less cobbled together what we (thought that we) needed to know. You need to know a lot of history, about when Panama was founded, when it was sacked and by whom, when the canal was built, the date of the Torrijo-Carter Treaty and a lot more. Then you need to know something about the political organisation of Panama and, of course, a lot about the national folklore and culture and the various National Parks. And yes a guide should know what attractions her/his own province has to offer (know at least 5) and that other provinces also have attractions (at least 2). So geographical knowledge of Panama is a must! All in all it is not an exam you do easily without study. There are 200 points to be scored in total and you must manage 162 of them. Up to these latest examinations, so far in Santiago, only four out of sixty-three passed the exam… We think that our group has a better percentage, but we will only know by mid-November, when the results are in. Panamanians like fairs. The slightest excuse is good enough. Fairs with activities, finger foods, and souvenirs are popular. They are also a good way to raise some money for a good cause. 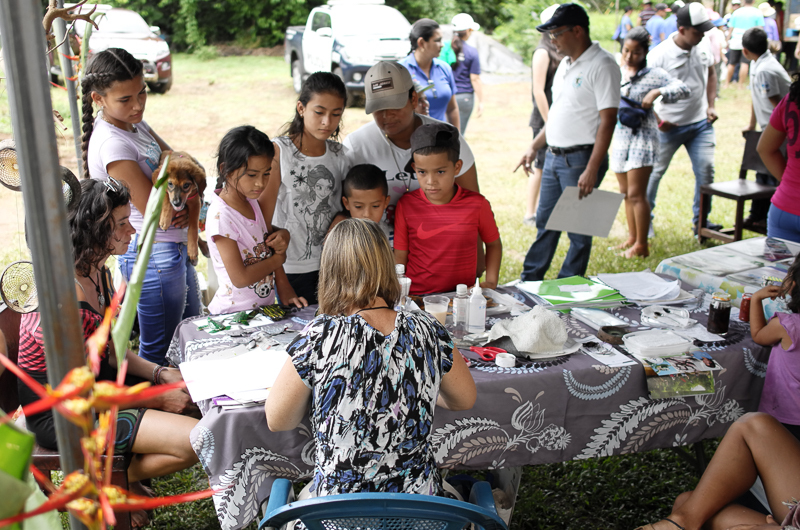 A week ago, there was one in Guarare to raise funds for the local school, on 30 Sept, there is one in Mariato to raise funds for the local school and on 25 Sept there was one to raise funds for turtle protection. During the high season, we usually do not have the time to go or participate in fairs, but in the low season we can. And who could possibly refuse an invite for a fair to raise funds for turtle protection? 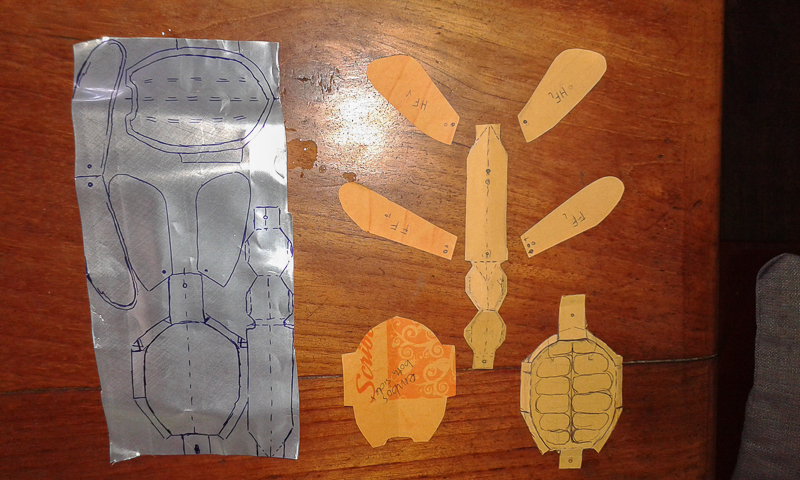 And being a biologist, the turtle as an education project needs to have at least the right number of scales between the eyes and on the back.So Loes thought about it for a while and slept on it for a night and then voilá… she sat down and made a turtle out of a soda can. While doing so, little Jose from Margarita came by and stayed to help. He was fascinated. Making the first tutle took an hour, the second was made in 30 minutes with help from José. He later painted several. A week later his elder brother, Juan, came by, and made one together with Loes and took home one model. 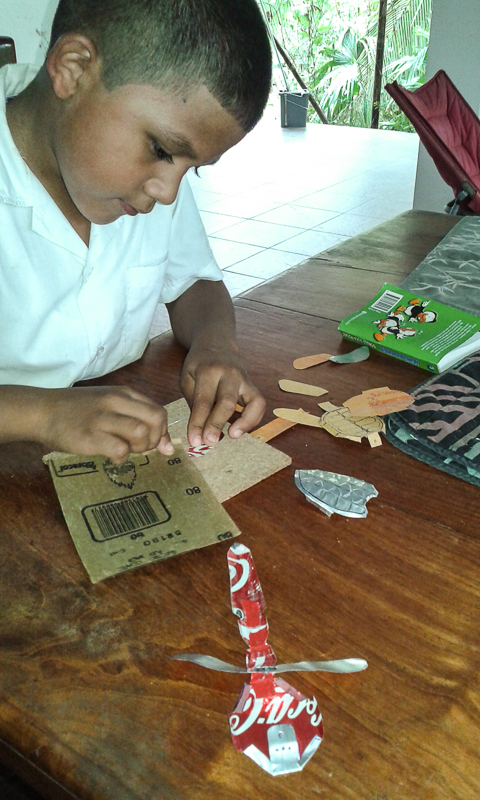 He since made more at home and he is going to sell them on the 30th in Mariato at the school fair. And a few days ago Loes sat at a table in Russia Quebro and sold the copies of her three model turtles (a leatherback, a Carey and an Olive ridley) for one dollar, proceeds going to the turtle association, while showing people how to make them. You can make them yourselves and with a magnet strip attached, you can use them to decorate your fridge. The instructions are still in Spanish only but the models works in all languages. When you live in Panama and have a garden of about 8 hectares (20 acres) there are a number of animals you could keep. However we opted to not “keep” any, no cattle, no dog, no cat, no pets at all, under no circumstances ever. However, animals that are living wild on our property are starting to find out that we are a source of food, if they play their cards right. We are going to introduce them to you. Erica is one of “our” squirrels. They are variegated squirrels a species that is very variable. Erica is the standard version, with cream-coloured flanks and a dark brown back. We have two more squirrels regularly visiting us: Sione who is completely dark colored, and Nola, who has rufous sides and a dark brown back. In 2007 when we saw the first squirrel of their kind on the edge of our garden we were very happy. It was after all a pastureland that we bought and we were turning that into a forest. By now, there are enough high trees, bushes and palms everywhere and Erica and her conspecifics can move around the property without ever touching the ground. During their explorations, they found our coconut trees and also the coconuts. Since that discovery they have honed the art of opening a coconut with your teeth to perfection. 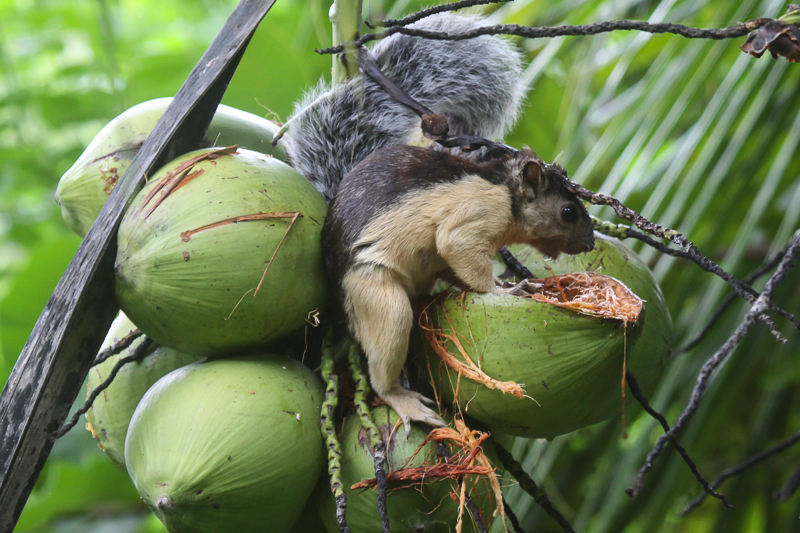 Nowadays it takes the squirrels about two, three hours to open a coconut, which then provides food for a few days. So not a bad investment of their time. They prefer the green coconuts. They will first drink the juice and then eat the flesh. Towards the end they have to make the hole a bit larger and they disappear almost completely into the fruit to get to the last bits. They do pull out frequently to check the area for predators and competitors though. Squirrels are not very sharing or giving in nature. For us, this is a minor problem. Our supply of fresh coconuts has decreased significantly. We used them to barter for other goodies with local people and for cooking. We do have a bit less to barter with now. On the other hand, when we do, the squirrels notice it too. They seem to have a pretty good idea of how many coconuts are around and after we remove a bunch for ourselves, we often see the squirrels check out the place carefully, obviously wondering how all those coconuts disappeared. We have been jumping around the several blog platforms on the internet for a bit. We hope that this (www.panamagic.wordpress.com) and www.hotelheliconiapanama.com/blog will be the final destination of our blogs. If you are new here, you can read about our prehistory on (www.panamagic.blogspot.com. After a bit of a pause we now hope to regularly blog here. Those who have been following us, know by now that our little projects tend to grow into rather complicated undertakings that take at least three times as long as we thought. Rest assured that this is still the case. And the last one has been one of the reasons for our relative silence on the internet. 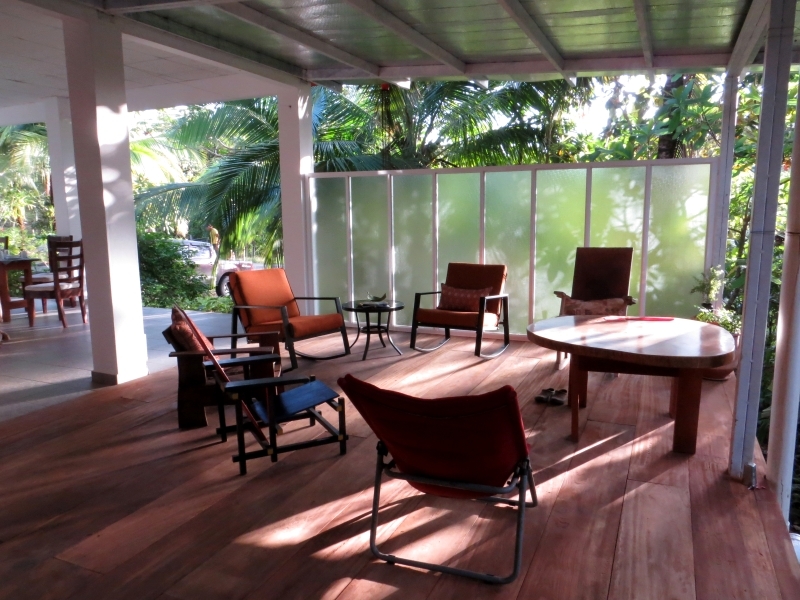 Over a year ago we decided that the ample verandas around our B&B were not quite ample enough. Some of our guests enjoyed our breakfasts and dinners so much that they tended to linger at the table. Furthermore, we became quite popular, so more and more people tended to linger. The veranda just was not wide enough to accommodate so many lingering people comfortably. 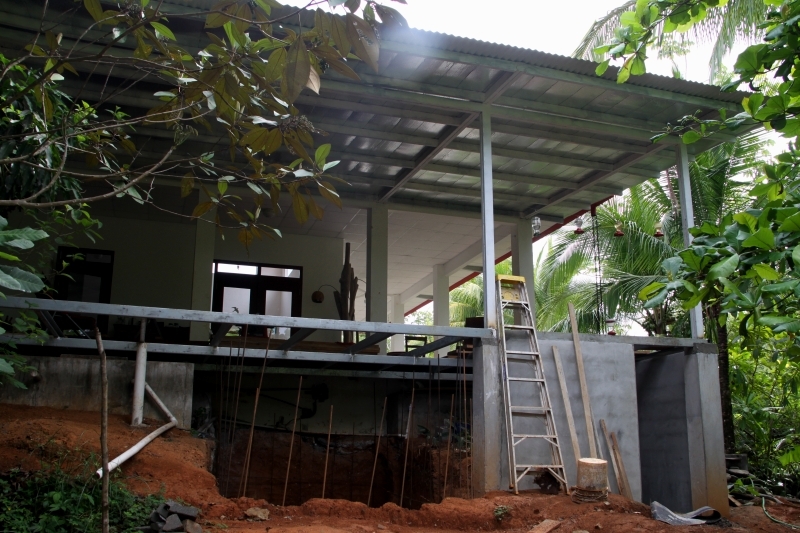 We designed a new veranda at the side of the house, to add about 37 square meters to our veranda. 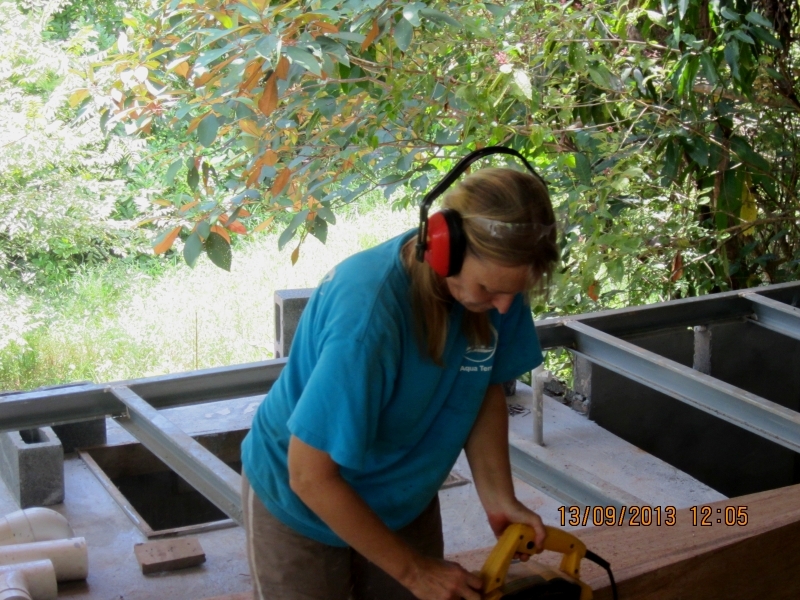 We ordered the wood (Espave or Wild Cashew, Anacardium excelsum), had concrete pillars made and bought steel for the supporting structure and for the roof as well as roofing materials. Putting in the pillars and welding the supporting structure and the roof went pretty quick. And in April 2013 we put on the first planks. By April we were also at the end of a very dry season and we had had a shortage of water. Since the space below the future floor was large we thought we might better use it and build a large water tank underneath the floor. We figured that doubling our water storage capacity should go a long way in preventing water shortages in the future. 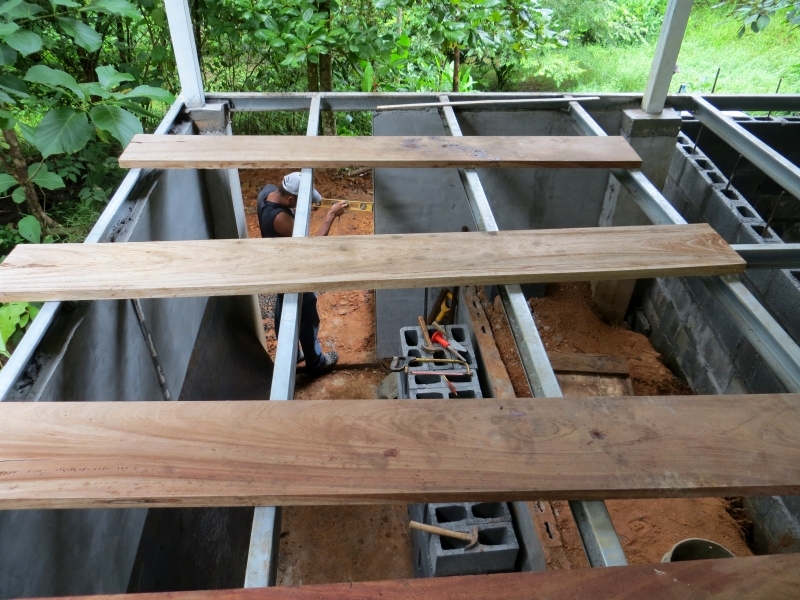 The result was that the veranda project was put on hold to start the water storage building. Building a twenty thousand litre storage tank proved to be a fairly large project. We needed about 45 bags of cement (that is some 2000 kg), a few cubic metres of sand and gravel, 300 blocks and about 150 metres of iron reinforcement bars. The first step was to dig a hole about 4.5 m long, 3 m. wide and about 2 m deep. 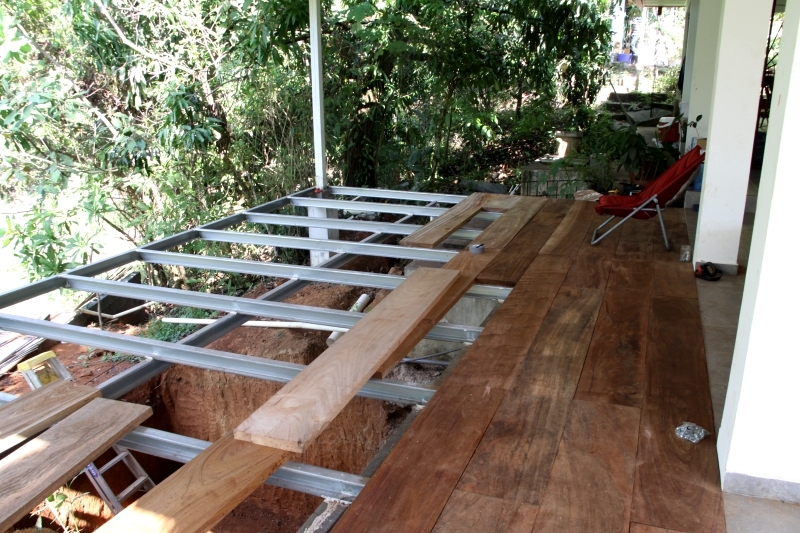 The next step was to pour the slab of the floor. But the guy we wanted for that job, was busy somewhere else. We were quite anxious to get the right man for this job, because you have to be absolutely certain that the tank is water proof. Demolishing and rebuilding a leaking a water tank was about the very last thing we wanted to face. 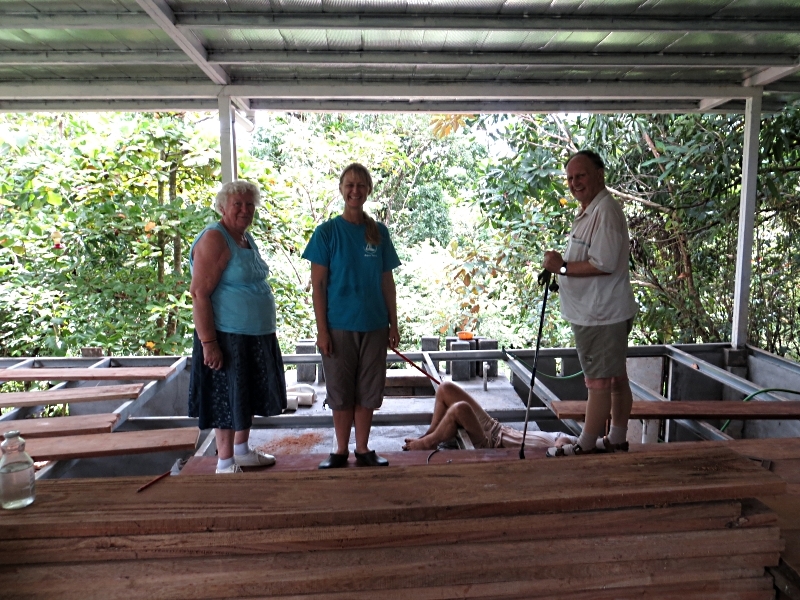 While waiting for the guy to poor the floor of the tank, we realised that we were also seriously lacking storage space and that there was still plenty of room under the future veranda to build a storage room. We have all sorts of things lying about that need storing: water hoses, pumps, electric cords for pumps, empty beer crates, wine bottles (full and empty), boxes with masks and fins we take to Coiba and a gazillion other things that we keep because maybe we might need them in the distant future. So, extra storage space was also created underneath the future veranda. Building the storage room should be a much simpler and smaller job, so that could be done by a less experienced mason, who was looking for a job. We started to do some more digging and build some walls to create a storage room. It was indeed a much simpler job, but we are not so sure that it was smaller. The job took long enough anyway. 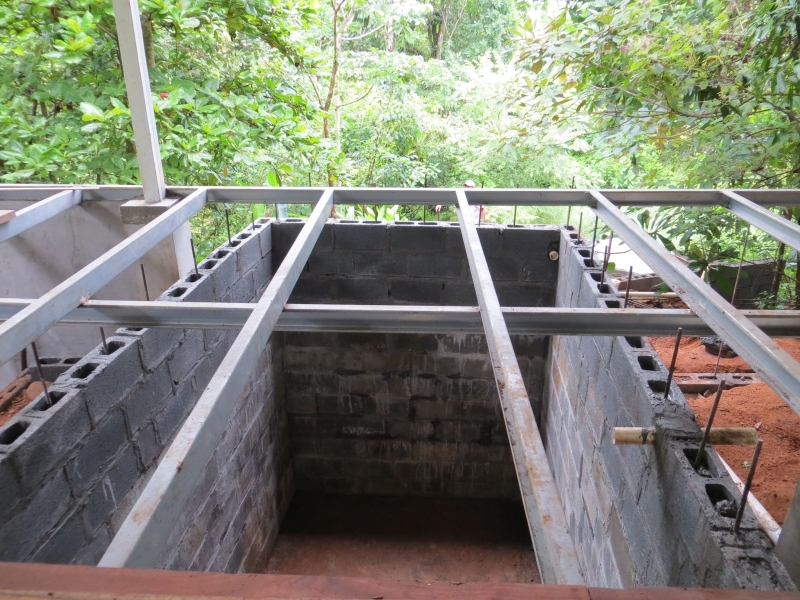 Finally, in September, the storage rooms were more or less finished and we managed to get the right man and all the materials we needed at the same time and at the same place and build the water storage tank. After that, we could finally continue with the veranda. That was still a large task. The wood came rather rough and almost straight and not very warped, while the steel beams of the support structure were welded at nearly straight angles. In other words: every plank had to be individually measured, cut and sanded before putting it in place. And Loes had this great idea that we should put in the screws from the below rather than from the top so you would not see them. This proved possible, provided you are able to bend your back and legs in about 25 odd angles at the same time and have your in-laws standing on the planks to force those straight and flush with the steel beams. And now, just before the end of the year, it all suddenly comes together! The wood is all in place, we bought some nice rocking chairs and two weeks ago we had a wall of frosted glass installed on the side facing the street. We have a big and small store room full of stuff – note that the store rooms were already full before they were even finished – and we have an extra water tank that is full and not leaking!